On June 13, 2001, I was in Washington, D.C. to give a keynote luncheon address at the annual meeting of Handgun Control, Inc. (now known as the Brady Campaign to Prevent Gun Violence). While I was there, I decided that I just had to go to the headquarters of the NRA, because I was fed up and frustrated. It was May 11 of 1999, three weeks after Columbine, that I wrote a letter to NRA President Charlton Heston. I wrote because I was so bothered by what has happening in America with gun violence. I asked Mr. Heston questions about the Columbine tragedy and about his organization's stands on gun control. After two years, I have never received a response to that letter, despite numerous requests, and despite statements from the NRA that I would receive a response. I never even received a simple note of acknowledgement. 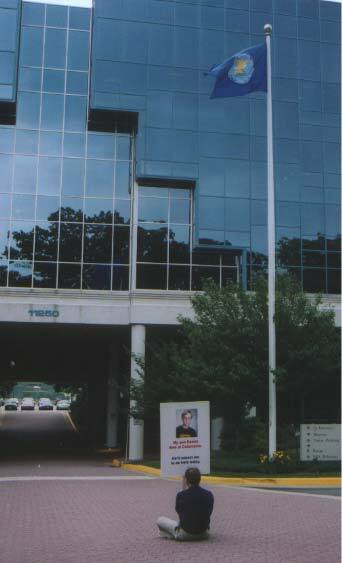 So, I went to the NRA national offices in Fairfax, Virginia. I carried a sign with Daniel's picture on it. 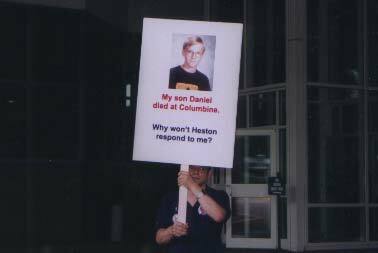 On one side were the words, "My son Daniel died at Columbine. He would expect me to be here today." On the other it read, "Why won't Heston respond to me?" After arriving I gave a security guard a statement explaining my complaint and requesting a response. Picketing legally along sidewalk outside headquarters. I arrived at 3:00 p.m. and was joined by a handful of people-four reporters and three people from the Brady Campaign organization. But I marched alone, because I wanted it that way. As I marched, one heckler in a car drove up and screamed, "Your son should have had a gun, you stupid m*f*." First I marched legally along the public sidewalk. After 45 minutes, I discovered the NRA public affairs office had talked to a reporter (but not me), so in disgust I moved onto NRA property. I first sat in their driveway. Then I marched around the main entrance area's circular driveway. had worse things happen. What really bothered me was that the NRA sent a man out to photograph me; they wouldn't send someone to talk to me, only to photograph me. 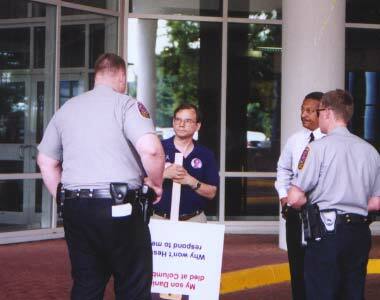 But I don't see how there was much for them to photograph: I was peaceful and respectful during my picketing. 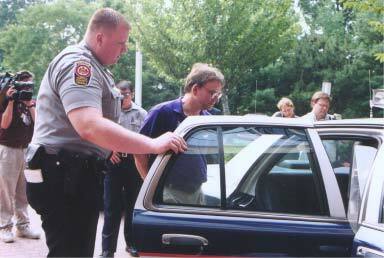 misdemeanor trespass charges, spent about an hour in a holding cell with about 18 other men and was released on $250 bail. I had to return on August 22 for a hearing. 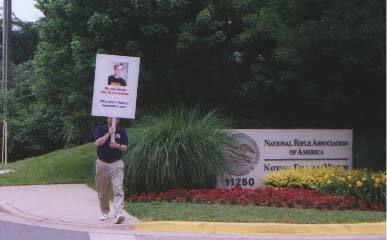 After the hearing, I then went again to NRA headquarters and marched for an hour. This time I only marched on the public sidewalk, not on NRA property. Not long after I arrived, a man pulling into the NRA parking lot called out to me, calling me a "crybaby." And, once again, the NRA sent out someone to photograph me (but once again, not to TALK to me.) I wasn't on their property, but he still took lots of photographs. After the photographer acknowledged to me that he was with the NRA, I asked him if he knew what it was like to lose a child to a gun shot. No response. I asked him nicely if I could tell him about my son Daniel. No response at all. He just walked away. Nice guy. No, the NRA doesn't like to hear the stories about victims. The next day I asked Andrew of the NRA Public Affairs office for the name of the photographer and asked WHY they took pictures of me and what they would do with them. He said he was not at liberty to answer any of my questions. Is the NRA obligated to respond to my letter to Heston? No, of course not. But why not acknowledge my letter in some way? Why not simply admit they won't answer me? Why tell me they'll respond and then not do so? What kind of organization so readily dismisses a man who has suffered what I have suffered? Have they no humanity, no compassion? Some would say the NRA should not respond to someone who has openly criticized the NRA, someone who is biased because of what happened to his son. On the contrary-I would say that if Charlton Heston and the NRA will not respond to someone who has suffered from gun violence, who WILL they respond to? If they feel their opposition to gun control laws is justified and without consequences, they ought to defend their position to me and others. I think that Mr. Heston's failure to respond to me is very symbolic of the NRA's failure to respond to the many questions that Americans have about gun violence and gun laws and loopholes. The NRA would rather not talk with us, they'd rather just work through the back rooms of politics, through campaign contributions, and through the intimidation of politicians by its members. I felt that I had to resort to civil disobedience in order to make a point: that the NRA is unwilling to respond to simple questions from a grieving father about the gun laws it supports. They are unwilling to face those who've suffered as a result of the public policies the NRA has promoted. How long will we have to wait to get answers? I continue to wait. America waits.